Sonny outside South Africa’s Soccer City Stadium in 2010. I’m looking forward to returning to South Africa where I’ll be covering Basketball Without Borders Africa activities and the NBA Africa Game 2018. This will be my second trip to South Africa. 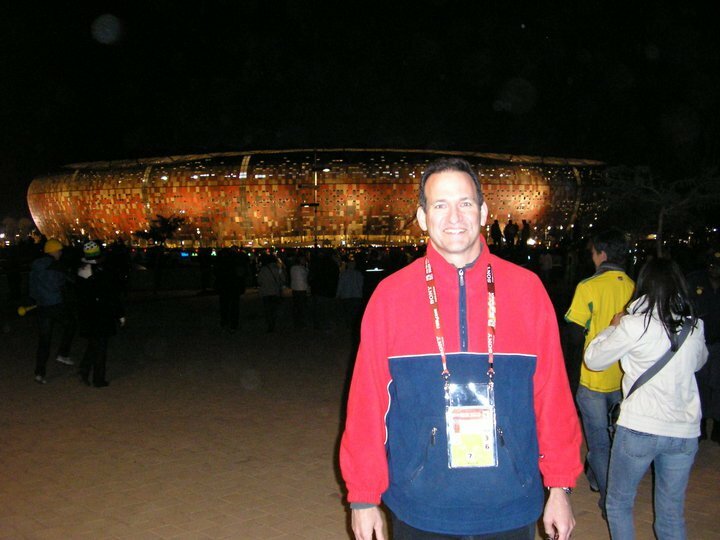 I traveled to the country eight years ago for coverage of the FIFA World Cup football tournament. The NBA Africa Game 2018 will be played Saturday, August 4, at Sun Arena in Pretoria. This will be the NBA’s third in game in Africa, and it will once again feature a Team Africa versus Team World format. The game will be played in support of the Nelson Mandela Foundation, and it also will honor the 100th anniversary of the birth of South Africa’s former President and Nobel Peace Prize winner. 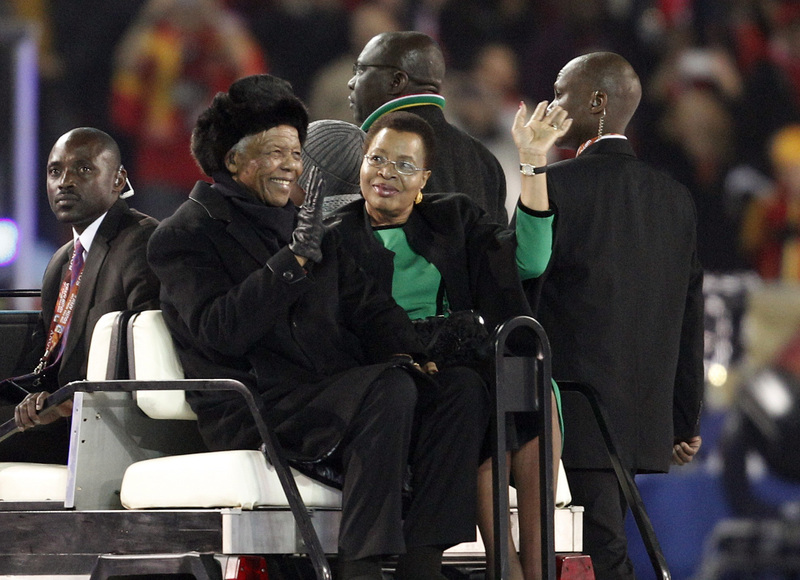 I remember being inside a chilly Soccer City Stadium when Nelson Mandela waved to more than 84,000 fans attending the Spain versus Netherlands World Cup final. It was a warm and special moment, and the last public appearance by the anti-apartheid icon. Nelson Mandela was a big sports fan, and I think if he were alive today, he might attend the NBA Africa Game 2018. The NBA says there are more than 80 current and former NBA players from Africa, or with direct family ties to the continent, including Hall of Famers Hakeem “The Dream” Olajuwon, who is from Nigeria, and Dikembe Mutombo, who is from the Democratic Republic of Congo. 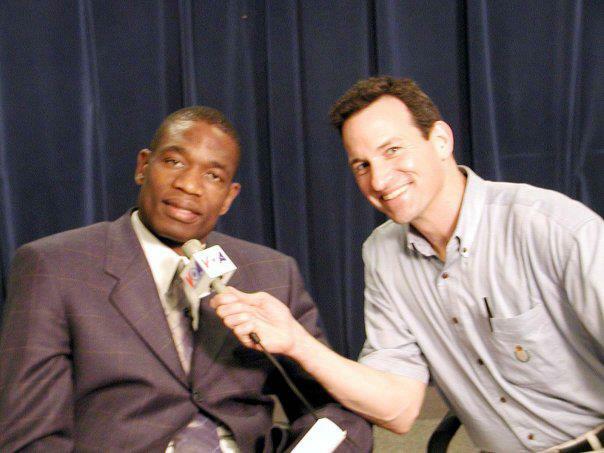 Sonny interviews Dikembe Mutombo in 2001. Mutombo is planning to attend the NBA Africa Game 2018, and so is another big man who left a big imprint on basketball, Kareem Abdul-Jabbar, the NBA’s all-time leading scorer. The NBA says league Commissioner Adam Silver will also participate in the game, as will Masai Ujiri, a 48-year-old Nigerian who is President of the NBA’s Toronto Raptors team. Team Africa includes 24-year-old Cameroonian Joel Embiid, the Philadelphia 76ers center who earned his first all-star selection last season. 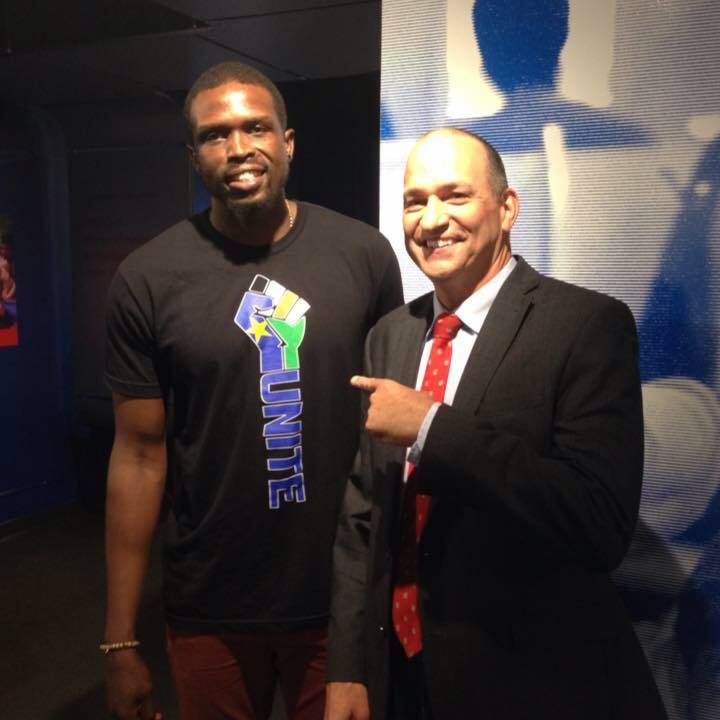 Luol Deng and Sonny at VOA headquarters in Washington, D.C.
Also on Team Africa are Luol Deng (Los Angeles Lakers; South Sudan), Bismack Biyombo (Charlotte Hornets; Democratic Republic of the Congo), Cheick Diallo (New Orleans Pelicans; Mali) and Pascal Siakam (Toronto Raptors; Cameroon), among others. The 24-year-old Siakam was drafted by the Raptors in 2016, four years after participating in a Basketball Without Borders (BWB) Africa camp. Since 2003, the NBA, in partnership with FIBA, has hosted the BWB camps for young basketball players. In addition to teaching basketball skills, the clinics promote leadership, education, sportsmanship and healthy living. This will be the 16th edition of Basketball Without Borders Africa.